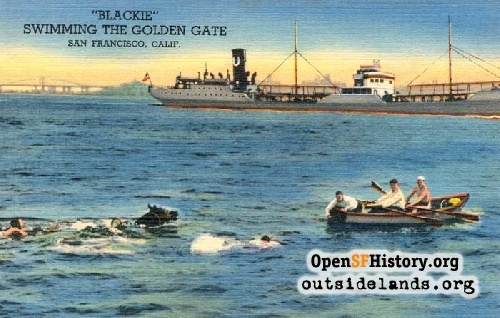 On October 1, 1938, a horse named Blackie made history in San Francisco Bay. This article originally appeared in the WNP member newsletter, Fall 2004. 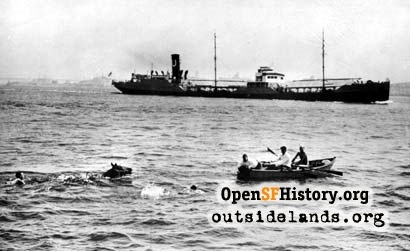 On October 1, 1938, a horse named Blackie made history in San Francisco Bay by swimming from the Marin County side to San Francisco's Crissy Field. In June 2004, Alex Spotorno, nephew of Shorty Roberts, the owner of the horse, spoke with us about his family and about that special day. It all started at Roberts-at-the-Beach, a restaurant at 2200 Great Highway (at Rivera Street).1 In the 1930s, Roberts-at-the-Beach was owned by Richie "Shorty" Roberts (the son of the original Shorty, Dominic Roberts). Al Spotorno remembers life out on the isolated sand dunes and remembers the horse. "I used to ride Blackie when I was 12 or 13 years old," recalls Al. "He was kept at the stable my family started on 48th Avenue." Roberts-at-the-Beach, was the place to go from the 1920s to the 1950s. Over the years, guests included C.S. Howard (owner of the race horse Seabiscuit), Mayors "Jimmy" Rolph and Angelo Rossi, columnist Herb Caen, and entertainer Bing Crosby. 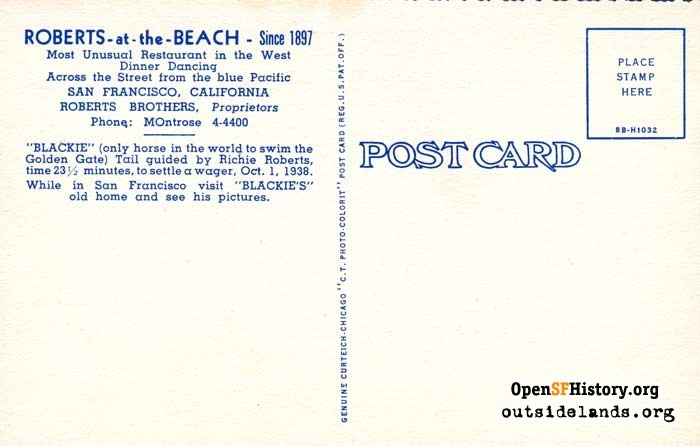 In late September 1938, Bill Kyne, of the Bay Meadows race track, was at Roberts-at-the-Beach and said to Shorty Roberts that horses could not swim. Shorty's response was that his horse Blackie could swim across the Golden Gate. Kyne initially wagered $5,000 that this could not be done. 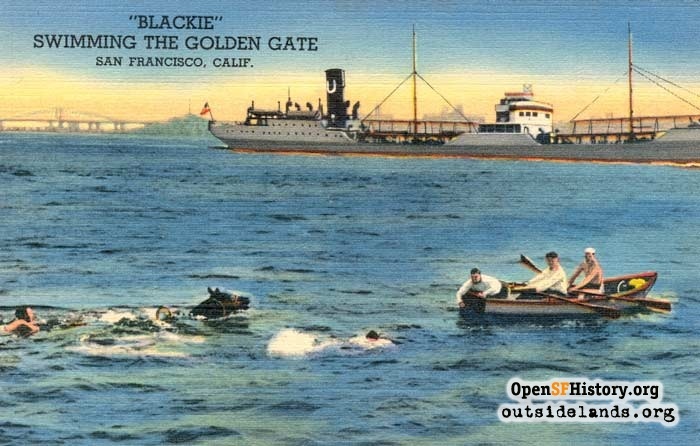 The final wager was $1,000, and the plan was for 12-year-old Blackie to swim from Lime Point in Marin County to San Francisco. At one point, the SPCA got wind of the plan and, worried about danger to Blackie, convinced the government to forbid Roberts to launch the horse from Marin County. "So Shorty's friend, A. P. Paladini, used his large fishing boat troller with a sling and net, and lowered Blackie down into the water from the side of the boat," according to Al Sportorno. Shorty accompanied the horse on the swim. According to Al, there were no wetsuits, so Shorty covered his body with grease. In addition, Shorty couldn't swim. He wore a life preserver and held onto Blackie's tail. The swim took 23 minutes and 15 seconds---an hour less than it had taken an Olympic swimmer. When Blackie and Shorty arrived in SF, the SPCA was waiting, but admitted that Shorty looked much worse than the horse and didn't cite him. Shorty always insisted that the horse loved swimming in the bay. In fact, when the two reached land, oats and hay were waiting for Blackie, but he turned around and began to head back toward the water. The evening after the swim, Roberts-at-the-Beach had a huge party to celebrate Blackie's accomplishment. The swim was a popular story in all the newspapers the next day. 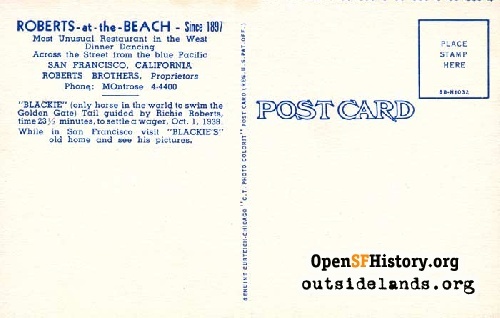 A story in a January 1949 San Francisco Call Bulletin said that a few years after the swim, Blackie rescued a police horse named Pan by pulling it out of soft sand. The saga of Blackie the horse was frequently repeated in San Francisco newspapers through the 1980s. 1. The restaurant Roberts-at-the-Beach on the Great Highway was not the same Roberts-at-the-Beach motel that Shorty Roberts later opened on Sloat Boulevard. Page updated 6 August 2012.